Updos are not only weather-proof, but they also highlight your glowing face, as well as your gown's neckline and back details. And as the following photos demonstrate, they're just as lovely for boho, rustic, vintage, and modern weddings as they are classic ones. From high to low, perfectly coiled to messy, and everything in between, your mane options are endless! 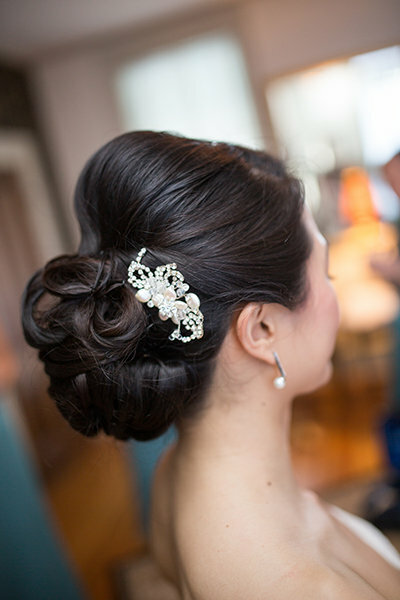 Your wedding is the perfect opportunity to wear an intricate updo without feeling overdone. A swirled chignon, draped twists, or artfully arranged curls create a polished look fit for a princess. A hairstyle with rolled up and tucked ends, or a classic French twist are striking yet simple to create. For a modern take, try adding subtle volume at the crown of the head. For a fresh and relaxed take on a bridal updo, consider a pretty off-center style on the side of your hair that will be facing the audience during your ceremony. Accentuate it with a sparkling hair clip or clusters of floral pins. Ballerina buns are graceful and poised, and they're ideal for brides with thicker locks; the bigger the bun, the more dramatic the look. Wrap a braided strand around the base for a unique touch or coordinate complementary updo styles with your bridesmaids to make a bold statement. A wispy updo with texture and body is a natural choice for a boho or rustic-themed wedding. This type of look is great for brides with naturally curly or wavy hair. If you have a layered cut, leave out some curls to softly frame your face. Add sparkling chandelier earrings or a headband to complete the romantic vibe.